World number one Michael van Gerwen was knocked out of the PDC World Championship last 16 by five-time world champion and Dutch compatriot Raymond van Barneveld. 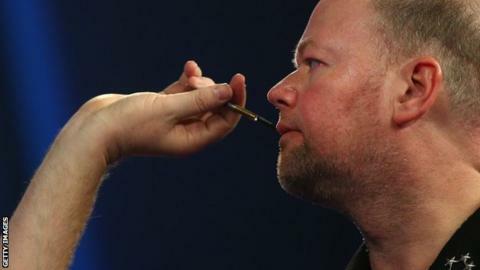 Van Barneveld, 48, has failed to win the title since 2007 but stunned the 2014 champion to win a thriller 4-3. The 16th seed plays eighth seed Michael Smith in the quarter-finals at Alexandra Palace, London. Van Gerwen's average of 105.78 is the highest ever for a loser in the event. Van Barneveld told Sky Sports: "In the second set, I started to believe in myself, the emotions came. "The World Championship means everything to me. The whole year I play fantastic, but this is something extra. "Michael is a true champion and we are good friends. I have been the man here five times and I believe I can be again." Van Gerwen added: "It is always sad when you lose. Raymond played well and I missed too many shots at the important moments. "It hurts a lot but what can you do? I can only blame myself." Van Gerwen won a competitive opening set, before watching Van Barneveld level by winning the second as both averaged over 104. Van Gerwen levelled again after Van Barneveld took a 2-1 lead, before once more falling behind. Throwing a 121 checkout, with Van Barneveld on three match darts, Van Gerwen made it 3-3 under intense pressure, before his rival eventually secured victory. Van Gerwen had won 11 of their previous 14 meetings this year. In other third-round matches, Scotland's defending champion Gary Anderson beat Vincent van der Voort 4-0 to progress to a quarter-final against James Wade, who continued his pursuit of a first final at Alexandra Palace with a 4-1 victory over fellow Englishman Jamie Caven. Adrian Lewis secured a similarly one-sided victory, also winning 4-0, against Mensur Suljovic of Austria, while Dutchman Jelle Klaasen beat Mervyn King 4-2 in a second-round encounter.